A critical first step to getting started with Mailchimp is setting up your audience. 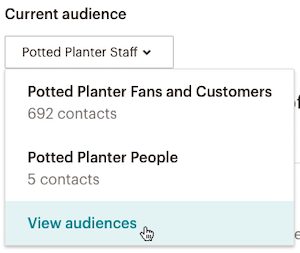 Whether you’re starting from scratch, or bringing existing contacts into Mailchimp, your audience is where you’ll store and manage all your contact data. In this article, you'll learn how to create and organize your audience. As a best practice, we recommend you maintain only one master audience in Mailchimp, and use tags and segments to organize and target your contacts. If you absolutely need to maintain separate audiences, you can repeat this process to create them. Audiences are independent of one another, so contact and audience data will be kept seperate on a per-audience basis. Contacts who appear in multiple audiences could also increase the cost of your Monthly Plan. Make sure you're familiar with our anti-spam practices and audience requirements before you begin this process. When you create a Mailchimp account, we generate an audience for you and populate it with details you provide. Each time you create a new audience, you'll be prompted to input default information like your From email address and a message to remind your contacts who you are. 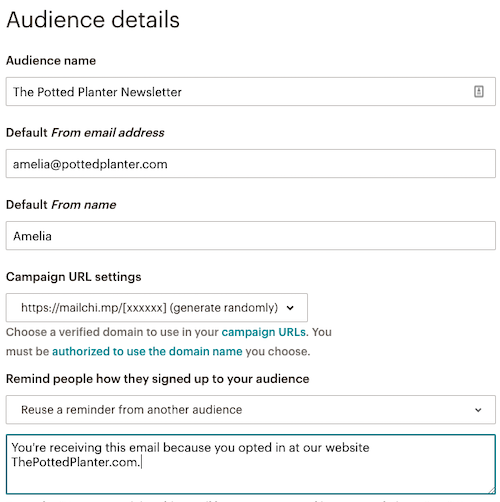 To create a new audience in your Mailchimp account, follow these steps. Click the Current audience drop-down and choose View audiences. In the confirmation box, click Create Audience. Review the Contact information for this audience, and edit if necessary. In the Form Settings section, choose the opt-in method for your audience. Check the box next to Enable double opt-in to send an opt-in confirmation email when someone subscribes to your marketing. Or, leave it unchecked to use single opt-in and add subscribed contacts to your audience right away. 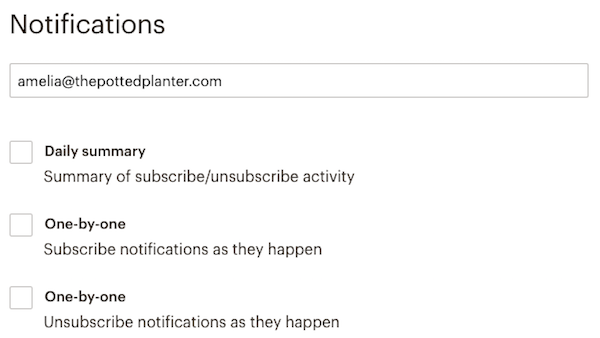 Enter the email address where you'd like to receive notifications about your audience, and select your notifications. 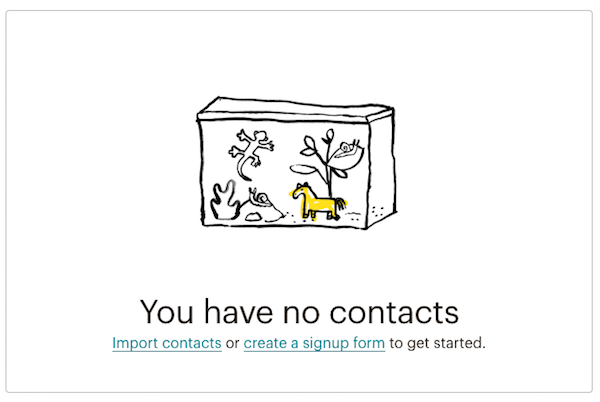 After you create your audience, you'll be able to import contacts or set up a signup form to collect new contacts. Now that you have an audience, there are a few technical things you should know before you add contacts. No need to memorize it all right now, but just an overview of the basics can help you decide how to best manage your audience. Here are some definitions that will help you understand audience structure in Mailchimp. Your audience should be your total collection of contacts, so you should only need one overall audience. If you still choose to create multiple audiences, be aware that audiences are independent of each other. They don’t share data or contact information. For example, if freddie@address.com is in two of your audiences, we count that as two contacts. It’s almost always best to have a single audience, and use our audience organization tools to separate and manage contacts. Tags are customizable labels for your contacts that you can use to organize your audience. Create tags for sets of contacts based on data only you know about them. You can send directly to tagged contacts, or segment based on tag data. Learn how to get started with tags. A segment is a filter, or query, that you can apply in your account to sort your contacts based on data we have about them. You can filter your contacts based on things like location, tag data, group membership, signup source, campaign activity, and more. Segments also let you customize your emails, ads, or webpages for the people you’ve identified. Custom content is smart marketing, and segments can help you get there. Learn how to get started with segments. Also known as merge fields, audience fields are where we keep your contacts’ basic information. Audience fields are a lot like cells in a spreadsheet. They store emails, names, birthdays, group preferences, addresses, or other information. You can use merge tags to pull audience field information into email campaigns, like a first-name greeting. Learn more about audience fields. Groups are specialized audience fields that correspond to fields on your signup forms. They let you ask your contacts to self-categorize with preset responses that you provide. For example, a garden shop might ask their contacts what best describes them: a gardener, landscaper, or indoor plant enthusiast. 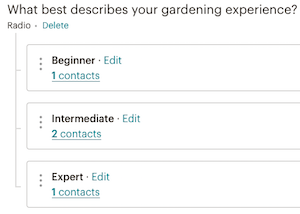 After contacts self-select their interests, you can create internal tags based on group data, or send email campaigns to a segment containing one group, a few groups, or all of them. Now that you’ve created an audience and you know the basics of audience structure, it’s time to import contacts! If you don’t have contacts yet, we can help you get some. Try a signup form, a social ad, or a landing page to get people to join your audience.